I have designed this site for historical and educational purposes. As an added bonus, we get to see photos of Accutrons as they came from the factory. Viewers are encouraged to contribute ads, displays and press releases they may have for inclusion. I will be working on this as an ongoing project and encourage active participation. Thanks, Tom Mister. 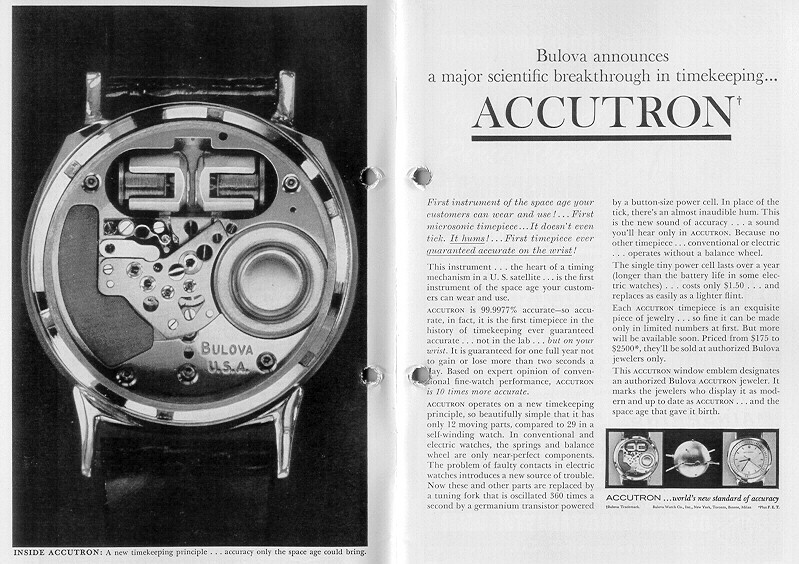 This is a November, 1960 ad touting the release of the NEW Accutron Timepieces. This press release from October, 1960 is the earliest print on Accutrons I have found. 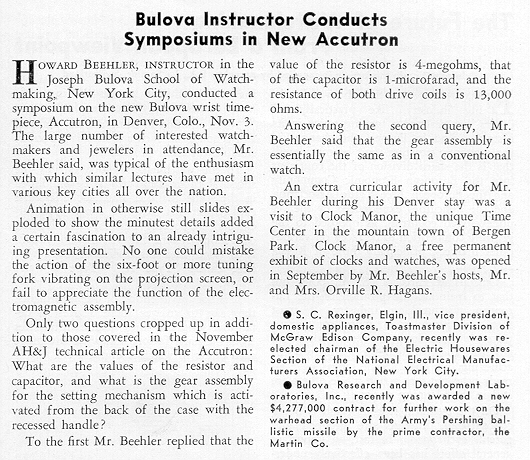 This December, 1960 press release tells how training for watchmakers has begun. They can learn to repair the new Accutron timepieces. This is a counter display pad sent to Jewelers in 1960 as an introductory package to Accutron Sonic Timepieces. Here is the beautiful movement pictured on the left side of the couter display. 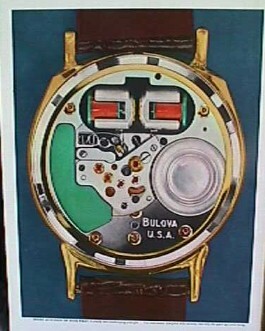 Here is a counter sign which came with the introductory kit sent to Bulova Jewelers to entice them into selling Accutrons. The kit contained ad mats, promotional suggestions and materials, this sign and the counter pad above. I will post info/drawings of seven of the 12 original 1960 releases soon. These were also included in this kit. 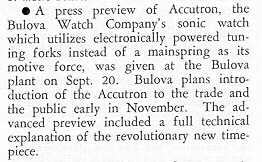 This press release from November, 1961 tells of the education Bulova is giving watchmakers in preparation of service to be needed for their new Accutron timepieces. This August, 1962 ad was aimed at jewelers. 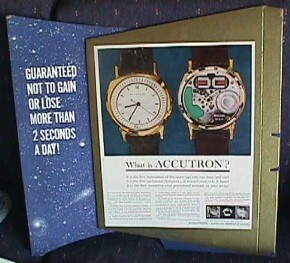 It explained the benefits of them selling Accutron watches. It featured a classic Spaceview. Text Copyright 1999-2010 © Thomas H. Mister, Sr.